This morning's Ithaca Journal reports on the legislature's state budget. It's not a final budget for the state - the governor and his line-item veto are yet to come. It looks like among the winners and losers, Dryden schools came out a winner. out of the additional $2.2 million the district could receive, compared to this year, approximately $1.5 million is earmarked for building projects, not basic school operations. The Journal also has a roundup of local administrators responses to the budget. The Monitor reports a stolen laptop at the William George Agency. I'm normally happy to receive unexpected checks. There's one large exception, however: those checks that come with a larger cost later. Sometimes those are the 'credit protection' plans, where credit card companies give you $2.50 now in exchange for a lot more over time. Sometimes they're credit offers, which at least come with clearly disclosed interest rates. Then there were the federal tax rebate checks a while ago, that seemed mostly to burn off cash that might have been used to reduce the federal debts future taxpayers don't look forward to inheriting. Now state government appears to have gotten into the same game. New York has lots of debts, and has driven more and more expenses to the local level. There's a little bright news this year, so what should we do? Pay down the debt? Reduce tax rates? No! Of course not! Let's send out property tax rebate checks, and make sure to do it in the fall, just before elections. Sending out checks - not to mention full-color fliers announcing their potential arrival - costs a lot of money. $750 million for the rebates alone, apparently. The budget is already increasing the state's debt by $11.7 billion, despite a surplus of $4 billion. Now, a lot of that debt is for projects that would reasonably be bonded, but does it really make sense to send out checks with one hand while signing up for bonds with the other? Perhaps rebate checks are wonderful for those who receive them. Certainly, rebates are fantastic for those who institute them. New York politicians can now claim action on tax reduction. But, according to Pulteney Town Supervisor Bill Weber, a rebate is not a rate reduction; it is an inefficient way to try to do the right thing. Weber believes that Keuka Lake will one day be too expensive for longtime residents to keep their properties, because as property values rise, which they are doing around Keuka, so too go property taxes. Rebates are not the answer to that situation; they are only a finger in the hole of the dike, and it's the smallest finger trying to plug what Weber believes is a growing-larger hole. To Weber, it seems it would be easier to just lower the property tax rate. This morning's Ithaca Journal visits the latest Dryden school budget meeting. The state legislature's budget includes a lot for Dryden, but the legislature passing the budget isn't enough to make that final: the governor needs to approve the budget too. (Or the legislature could override his vetoes.) When they hear from the state, they hope to reinstate some of the 14 proposed staff to be cut, replenish reserve funds dented by energy costs, and lower the tax levy increase from 12.85%. They'll meet again April 13th, with a final budget due the 20th. The Journal also has an interview with a Republican candidate for Sherwood Boehlert's congressional seat, former Seneca Falls Mayor Brad Jones. Jones supports the president in Iraq, wants to consider eliminating federal agencies like the Department of Education and the IRS, thinks "we need less spending and government," and a national sales tax, and wants to see ethanol or biodiesel production in this area. They're slimy, and crawling along the roads, moving at night. They're on the section of Thomas Road in Caroline, not the Dryden portion, but apparently they're also in Dryden along Ringwood Road. IC Professor John Confer is working to make salamander migrations less hazardous, and the Journal also has a piece on the life cycle of these amphibians. Also along the Caroline-Dryden border, there's a picture of Caroline resident and Dryden business-owner Michael Ludgate, noting that he leads mountain bike trips through the Hammond Hill State Forest. Dryden Seniors will be meeting next Monday, April 10th, at 11:30am at the Dryden Fire Hall (map). They'll have a meatloaf lunch at 12:15 ($5 for members, $6.50 for non-members), a talk on investment strategies for seniors, and a ladies hat parade. TC3 will be having an open house Friday, April 7th, from 11:00am to 2:00pm. Candidates must be able to read and write; must be a citizen of the United States; must be at least 18 years of age; must have lived in the district for at least one year; may not have been removed from any school district office within the preceding year; may not reside with another member of the same school board as a member of the same family; may not be a current employee of the school board; may not simultaneously hold another incompatible public office. The Dryden Youth Commission is looking for a new member. in 2004, just 43 percent of single-family home sales were affordable to households at or below 100 percent of the median family income for Tompkins County. I think that means that only 43% of houses were affordable to 50% of Tompkins County residents, but I'm not completely sure. I'll need to get a copy of the report to figure that one out. Also, the article notes that site costs for the new emergency communications system have climbed from the $2.5 million authorized in 2005 to $4.5 million. There's also an article on New York State's backdoor borrowing. It would be nice to draw a clear line between ordinary capital project borrowing and more creative borrowing, like the legislature and Governor do through the Dormitory Authority and Empire State Development Corporation. Making that work will likely require changing a lot of rules, but hopefully it'll happen in the next few years. This morning's Ithaca Journal explores the impact of higher gas prices on the Ithaca area. It even includes a handy list of current gas prices, though it's kind of hard to tell what they mean when a station is listed only as "Citgo, Route 13". Democrats support pursuing terrorists, but unlike some Republicans we recognize that a competent president could defeat the terrorists without violating our laws. 9/11 did not change the simple fact that we are a nation of laws. Nothing in the Constitution permits President Bush to play king and choose what laws he will follow. The editorial reminds readers of the tremendous work TST BOCES does for area school districts. In fact, it was the fascists that first coined the term, "corporate state" to describe this new world order. Sound familiar? If so, then it's time for us to wake up because with the passing of the Patriot Act and the ascendancy of an Imperial Presidency that is above the law, we can no longer say, "It can't happen here." A guest column on lobbyists in Albany by Paul Fitzsimmons of Montour Falls is even less generous to the lobbyists than I was a few weeks ago, and proposes abolishing it. The Journal's editorial lauds the work of IPEI, the Ithaca Public Education Initiative, which has raised money for education in the Ithaca school district, and notes TC3 president Carl Haynes' participation in their 10-year celebration. The Dryden news in this morning's Ithaca Journal all seems to gravitate toward Ithaca somehow. County Legislator Martha Robertson is quoted in her role as a member of the Tompkins County Industrial Agency Board about a moratorium on applications for tax abatements under the density policy in downtown Ithaca. The moratorium is part of a timetable for determining the future of that density policy, which was designed to encourage more and denser development in the heart of the city. Students in the Ithaca schools, including southwestern Dryden will no longer be allowed to wear the confederate flag after it has been the source of disputes among students. On the opinion page, former County Legislature candidate W. David Restey writes to complain about Congressman Maurice Hinchey's car rentals. Unless he's moved recently, Restey is a Dryden resident, but listed as Ithaca. (So was Jason Leifer earlier this week.) Also, Hinchey's district includes Ithaca, but not Dryden. This morning's Ithaca Journal includes a guest column by Abi Munro of Better Housing for Tompkins County. Munro writes of the organization's community workshops to discuss housing issues with communities throughout the county in an effort to make it easier to build housing a broad range of people can afford. 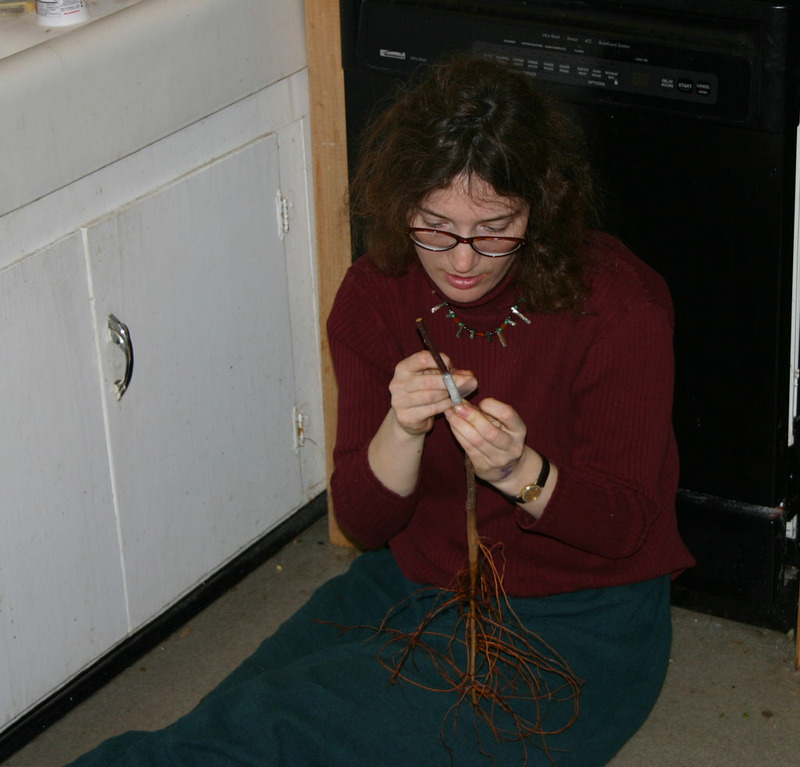 The online version of the article doesn't list the workshops, but there will be two in Dryden. One will be May 9th from 6:00pm to 7:30pm, at Houtz Hall in Etna Houtz Hall (map). Another will be on May 25th, also from 6:00pm to 7:30pm, at the Dryden Town Hall (map). Apparently last week's Zoning Board of Appeals meeting went much longer than usual, with one of the issues a request for a variance to put a residential windmill at a house on Mount Pleasant. 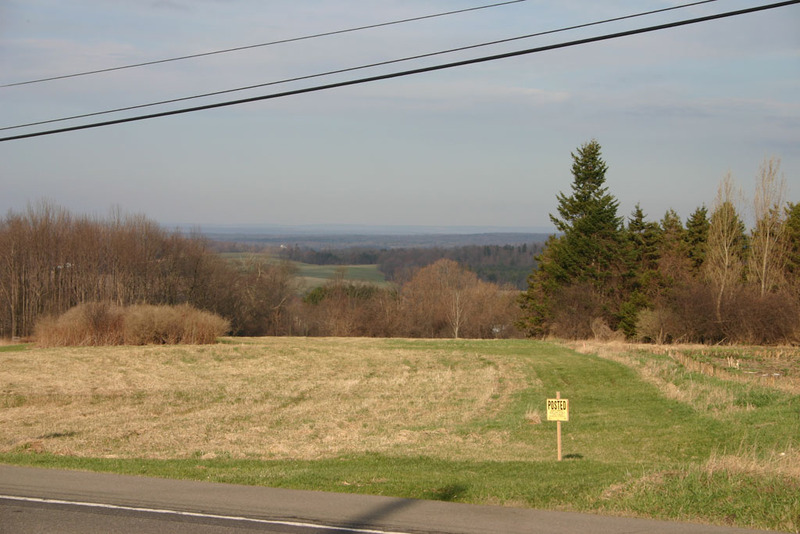 They couldn't grant it, because the current interpretation of town zoning law, which became clear last April in discussion of Cornell's now-abandoned wind farm plan, is that windmills of all kinds are prohibited because they aren't listed as allowed. 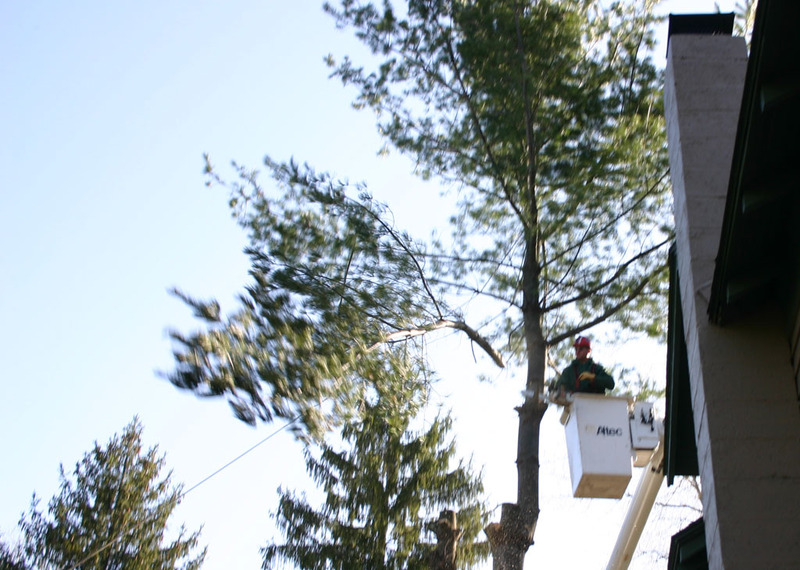 The town has been talking about adding zoning to permit residential windmills since then, notably in discussion of a model wind ordinance the town board hadn't liked, which came from the county's Environmental Management Council (EMC). 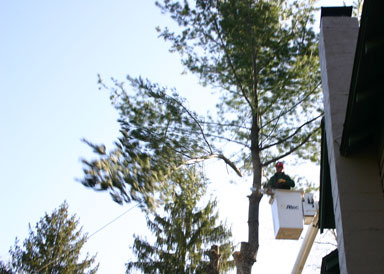 The town has been working on a new ordinance that would permit residential windmills but not industrial operations, like the one Cornell was proposing. It's on the agenda for Thursday's meeting, as item 13a, and I understand people are likely to turn out to hear about it. My reading of this very early rough draft is that it will facilitate residents' use of alternative enery sources while protecting the neighborhood and environment. The Dryden Town Board will meet Thursday at 7:00pm at the Dryden Town Hall (map). I'm guessing that this ordinance will take some time going through the system, as it seems likely that the Planning Board needs to review it as well. This morning's Ithaca Journal mentions "The West of Somewhere Cowboy Gathering", which will be held May 5th through 7th at the Amazing Grace Bed and Breakfast (map). The announcement (PDF) lists camping Friday night with a sing-along, horse ride-outs, barbecue, music, and kids' activities Saturday, and a Sunday morning cowboy church. The event is a fund-raiser for the Tompkins County Red Cross. The Rochester paper reported last week that retiring Congressman Sherwood Boehlert received the highest ranking of any Republican on a scorecard from Republicans for Environmental Progress. Boehlert actually managed to score 108 out of 100, as the group gave extra bonus points for work beyond the votes they listed. You can read their whole report for more. This week's Dryden Town Talk seems to be the Easter Week edition, as Cathy Wakeman focuses on church activities. She reports on the Camp Farthest Out activities that will be at the Reach Out for Christ church on April 21st and 22nd, and lists church services at Dryden's Presbyterian and Methodist churches as well as the Etna Community Church. Dryden fire chief Ron Flynn is quoted in an article about the destructive fire which gutted the clock tower building in Cortland yesterday about the speed at which the fire spread, saying "When they got there, there was smoke coming from just about everywhere in the building,"
The Monitor reports that a Dryden man already in the Tompkins County Jail now faces two charges of assaulting corrections officers. The Ithaca School Board passed a budget with a 4.9% increase in spending and a 4.7% increase in taxes. Governor Pataki has his veto pen out, and there may be some drama over the next few months as the legislature overrides them or not, and possibly legal action over the roles of the governor and legislature as well. We need strong statements of purpose and direction, built on economic and political foundations. Not finger pointing and you're-all-going-to-hell rhetoric. Otherwise the right is collapsing into a muddle of pointless bickering no different from the left. The Journal's editorial encourages readers to write state senators about the need to address FOIL reform, something Majority Leader Joseph Bruno seems content to sit on. Open government? How would that help him? This morning's Ithaca Journal visits Reef Encounters, exploring the colorful world of coral growing in a Freeville basement. Owner Steve Lowes talks about what's involved in growing coral, the difficulties facing coral reefs in their natural habitat, and the powerful filtration work coral performs on the surrounding water. Governor Pataki vetoed another $3 billion from the state budget, eliminating the $750 million in rebate checks I discussed earlier as well as SUNY and community college capital projects, costing TC3 $2.4 million toward its master plan amendment. "There are a lot of new programs that are perfectly good programs... (but) they are not fiscally sustainable." He eliminated a $200 million fund for "pork-barrel" or pet projects in lawmakers' home districts such as baseball fields, Flag Day parades and local halls of fame. In the meantime, the more raw materials that can be salvaged from the waste stream and the more pollutants that can be kept from landfills and burn barrels, the better this planet is for every thing that shares it. Recent steps by the county Board of Health and the Solid Waste Management Division offer great promise to do just that. For those efforts, we all ought to take a deep, cleaner breath and say "thanks." 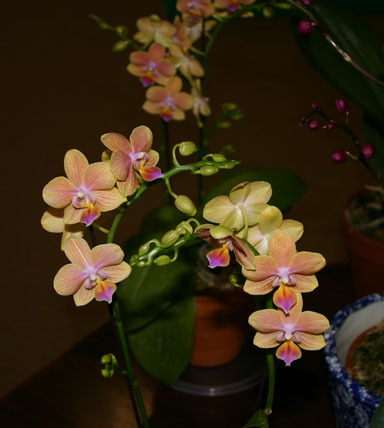 This morning's Ithaca Journal visits The Orchid Place, a greenhouse and retail store for an amazing set of orchids. I went over to take a picture of their sign for this site, but found myself invited into the store and into the greenhouse, which was incredible. I especially liked their cooling system, which blows air through wet cardboard, cooling and humidifying at the same time. There's also an article on the Dryden schools budget, which now appears to include a spending increase of 7.39% and a tax levy increase of 9.66%; both of those feel higher than numbers I've seen at other local districts. This morning's Ithaca Journal leads with the news that Cayuga Press is leaving its Hanshaw Road facilities for an Empire Zone in Cortland. The Town Board passed a resolution Thursday night that their departure was for reasons that couldn't readily be fixed here. Board members Steve Stelick and Mary Ann Sumner wanted to wait a month before waving farewell, but Marty Christofferson pushed for a faster vote. As the article notes, the company felt unable to expand in its current locations, though it will be keeping those. Peter Schug noted at the meeting that the company will expand its Mailbox of Ithaca operation by 4 or 5 people, and that there might be retail in the other location. Continuing with the Town Board meeting, the Journal also has a brief summary of what happened that has a few problems. They note the discussion of the alternative energy ordinance, but talk about an ice-skating rink when the plans are for a skateboard park, and focus on a 10-second mention of the Cortland Road Sewer District's continuing lack of progress while the board spent considerably more time on the prospect of an Ellis Hollow Road water district. There's an article on declining enrollments at local school districts that notes that Dryden's enrollment has fallen 11.4% since 1998, and Ithaca's by 11.1%. Only the Lansing schools show a gain in the area, with a 4.7% increase. An article on how districts are dealing with this notes cooperation between the Dryden and Groton wrestling teams. An article on the upcoming tax deadline starts with Nancy Crawford of Freeville, and E.W. Seymour of Freeville has a letter continuing an argument about Saddam Hussein's weapons capabilities. In 2004, city councilors didn’t reappoint Camera to the Planning Board after some councilors complained of his maverick ways of dealing with projects considered by the board. Camera said he asked developers difficult questions about their proposed projects and that his supporters liked his strong views of trying to preserve downtown buildings, rather than razing them for new development, he said. In a press release, Camera laid out a 10-point "common sense" agenda that includes pushing for an exit from Iraq before the summer of 2007, in cooperation with the Iraqi government; developing a "win-win-win" energy strategy for people instead of big business; and fighting to repeal the 2003 Bush tax cuts and adopting a "pay-as-you-go" approach to government spending. Camera also said he fully expects that President Bush will be impeached, and he'd support that on the grounds of incompetence. "We can argue about how many lies he's told," he said, "but I'd rather evaluate it on competency of administering the federal government." Camera is also against the practice of "earmarking," when politicians tack extra money onto spending bills for pet projects in their home districts. He said earmarks have a corruptive influence on politics which legislators use as bribes to stay in power. Boehlert was unusual for a modern Republican, but Camera is unexpected. Hopefully, a conversation will break out among the Republican candidates at some point, and we'll get to see more of their views. I'm normally an advocate of having separate places for people to walk and drive. Cars rushing by at 55 or even 45mph while you're walking on a shoulder that cars sometimes use isn't generally fun. I usually avoid walking on Route 13 in particular, as drivers seem to think they own that road exclusively. Sometimes, however, it's worth taking a walk even in a place that isn't welcoming. Last week I had my car repaired at G.L. Mullen Body Shop, 290 Cortland Road, after hitting a deer (which walked away) one evening on Hanshaw Road. I dropped the car off around 8:00am, and walked down to the Village of Dryden along Route 13. I've driven this stretch of road countless times, and noticed a few things. Businesses in Dryden, TC3, the Dryden Book Barn, Crown Construction, and Lilley's Tack and Feed. That's most of what I remember about it. I don't remember the view coming into the village, the panoramas to either side, or the junk along the side of the road. This time I did, taking pictures along the way. Looking north from Route 13, framed by road, powerlines, and sign. 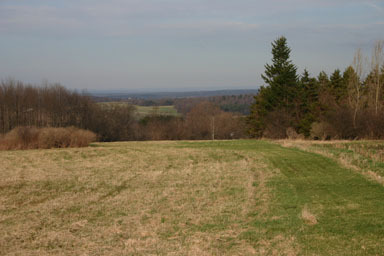 Looking north from Route 13, without powerlines, road, or sign. It doesn't seem like it should make that big a difference, but it was fairly incredible to me how removing the powerlines and related noise from a scene could make it feel much more open, more intriguing. 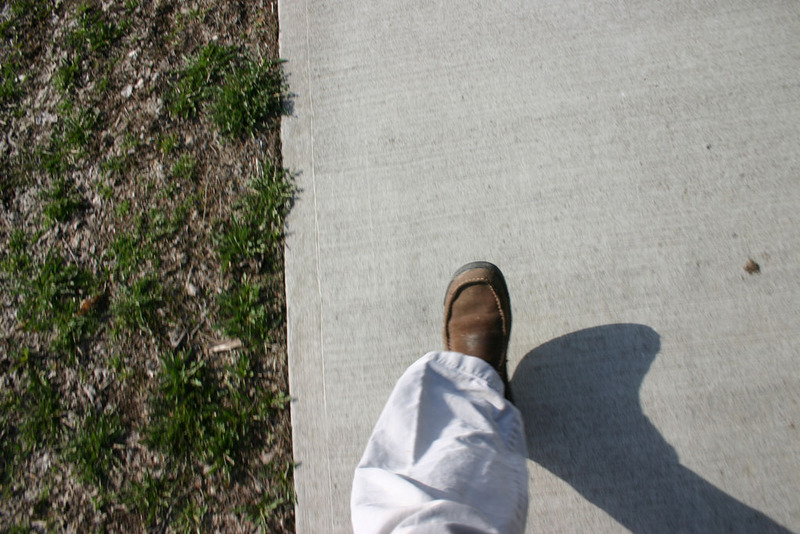 A lot of people do their walking in downtowns, in the mall, or in other areas built for pedestrians. That's sensible. But still, sometime, if you want the chance to see what we're missing by driving around all the time, walk someplace where you normally only drive. See what you've been missing. Update: NYCO takes this a bit further, and writes about litter. I did take a few litter pictures, but it would have been easy to take a few hundred more. The study found that the median price of a single-family home rose from $92,000 in 1998 to $140,000 in 2004, and that over the last 10 years, “home price increases have exceeded household income growth by more than 20 percent.�? There will be two workshops in Dryden to discuss these issues. One will be May 9th from 6:00pm to 7:30pm, at Houtz Hall in Etna (map). Another will be on May 25th, also from 6:00pm to 7:30pm, at the Dryden Town Hall (map). The Journal also brings immigration issues home, with an exploration of local perspectives on immigration. It visits the Space farm, in Groton just north of the Dryden line, where five legal Mexican workers help run a dairy farm. The Journal's editorial opposes the banning of the Confederate flag at Ithaca High School. "Spongebob, Finding Nemo... some sort of theme that kids relate to or get excited about. You've got to play on things that are marketed to them. Not all are negative if you're responsible." I'm starting a multi-year project this spring, changing the current mix of shade trees and ornamental plants on my property and increasing the number of edible or otherwise useful plants. I'm planning to use techniques from permaculture, developing a system of plants here that will hopefully require fewer inputs - like fertilizer, pesticides, weeding, and water - while producing useful and even tasty results. Unfortunately, getting to that means some fairly big changes. Today I had seven trees removed from the yard. Well, felled, actually. I kept all of the trees' contents, which are, when you think about it, largely the soil I have here taken up and combined with air to create a new form. 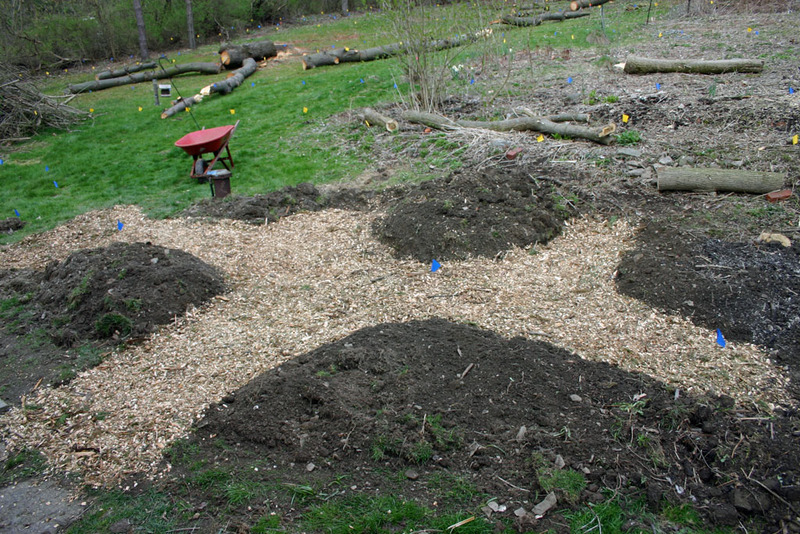 The tops of the trees were mulched, giving me a huge pile of mulch to use in the garden, and I'll be using the trunks in a number of projects I'll be describing here eventually. 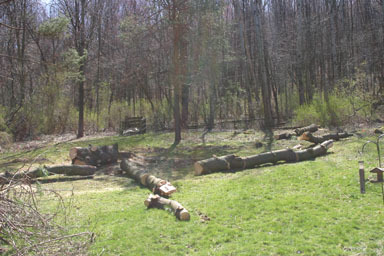 Logs remaining in the backyard. 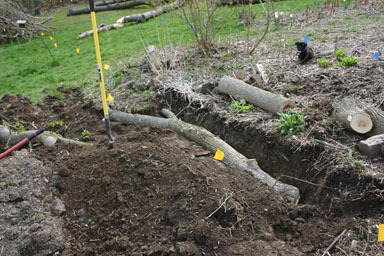 I had a hard time finding tree care places that would come and give me an estimate, playing a few rounds of phone tag. Unfortunately the work needed to be done fairly soon, as other projects depended on both removing the trees and having the materials created by the trees available. Cascadilla Tree Care had trimmed the trees here well a few years ago, and did all this work this morning, pretty much perfect timing for the next few projects I'll be getting underway. I've posted a gallery of photos from this morning's work. I find the new appearance of my yard pretty shocking. I liked those trees, and it'll be years before I establish the new character of the place. Still, it's a first step on what will be a long road. This morning's Ithaca Journal reports on some strange aspects of the No Child Left Behind law that let school districts exclude test scores for some groups to avoid penalties. Usually those groups are non-white students, though white students' scores were excluded at Ithaca's Beverly J. Martin Elementary. The Journal looks at the Ithaca school district and then groups other area schools together, but since 100% of black, Asian, Hispanic, and Native American students were excluded in all the non-Ithaca districts, it's a safe bet they were also excluded in Dryden. In the print edition, the Journal notes the $3.09 price for 89 octane unleaded gas at the Sunoco on Routes 13 and 366. The last time I was in the Village of Dryden I saw some $3 prices there too. There's also a mention in the Community Calendar of a Soup and Salad Supper tonight at the Etna Community Association's Houtz Hall (map). It'll run from 5:30pm to 7:00pm, and is $5 for adults, $4 for seniors, $2 for children, and free for kids under five. Tom Canfield, Civil War researcher and reenactor, will look beyond the famous battle events. He will focus on how local areas were changed by the large number of troops moving through. Come at 7 pm. to view an exhibit of Tom's civil war items. 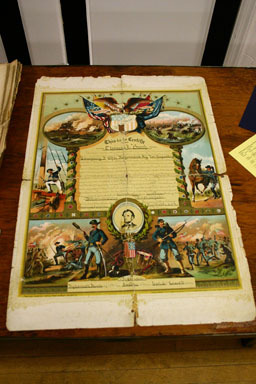 You are invited to bring your civil war memorabilia to display also. That's Tuesday, April 25th, at the Village Hall. Exhibits open at 7:00pm, and the talk will start at 7:30pm. Like all DTHS events, admission is free. 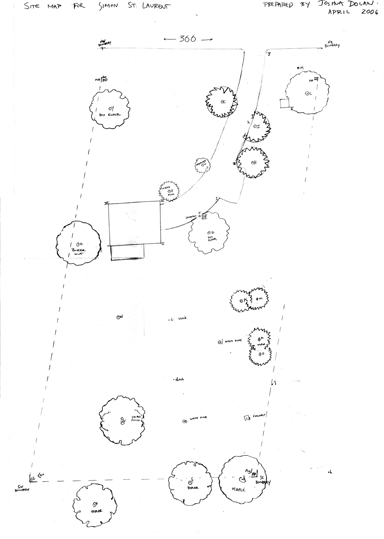 I mentioned earlier that I was working on permaculture design for my house and its surrounding area. A key part of that is planning, and I've hired Joshua Dolan to help with that and more. 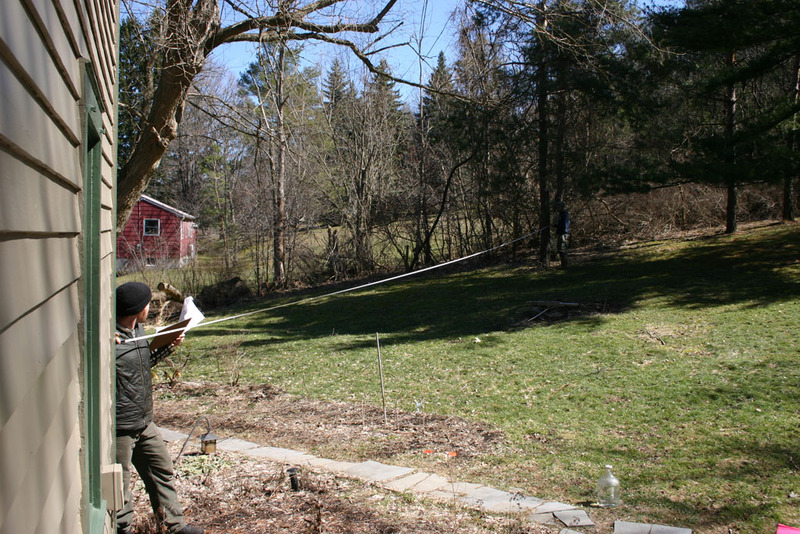 To get started, he and Steve Gabriel (of the Finger Lakes Permaculture Institute) spent a morning mapping my lawn, its trees, and its forest edges. The approach they used required a 100-foot tape measure and a few marker flags. I started them off with a survey map of my house to give them a rough picture of what they had to map and what the property surveyors had considered landmarks. They then took measurements from the corners of the house, splitting the area up into four quadrants, to various objects and flags, and took measurements among the flags and objects too. Joshua Dolan and Steve Gabriel collect measurements to build a map. Detailed map of my house area. This parcel is a strange parallelogram. Some of the trees they show were cut down yesterday, but this base map should be key to future work. Next week we'll be adding contour lines, hopefully. I've posted a small gallery of photos of the measurement process as well. I see in this week's issue of The Shopper that the Dryden Sertoma Club will be having a dessert reception to honor former County Legislator Mike Lane for his many years of service to the Dryden community. They'll be having it next Tuesday, April 25th, at 6:30pm in the TC3 Forum. They ask for an RSVP to Cathy and Vinny at 844-9163. It's been bright and sunny, but every time I've gone into downtown Ithaca I've noticed that it seems to be a week ahead of us for flowers. Today looks pretty nice, though! This reminds me. I've been looking at USDA zone maps lately and wondering whether Tompkins County - at least its eastern side - is in a cold spot within the state. On a detail map of New York State zones, we're in zone 5a, the colder side of zone 5, despite being almost surrounded by 5b, which is warmer. On a 2003 map of possibly revised zones (Warning - 5.7MB PDF! ), we're a green spot of zone 5 completely surrounded by zone 6. If anyone has an explanation, I'd be curious. I published Environmental Planner Dan Kwasnowski's proposed alternative energy ordinance and accompanying explanation last week, but I wasn't aware that the Town Attorney, Mahlon Perkins, had also weighed in with his opinion. Last week, Dan Kwasnowski asked me to review a Renewable Energy Conversion Systems Ordinance (ordinance) he drafted. I attempted to review it, but found it so incomplete and disjointed that I recommended to the Supervisor that the Board follow a different course of action. My recommended course of actions differs from Dans, since his presupposes allowing wind generators and the adoption of regulations. Perkins offers no explanation of how the ordinance (699KB PDF) is incomplete or disjointed, nor did I get any great sense of that at the Town Board meeting last Thursday. If there were technical problems with the ordinance, I would expect the town's attorney to explain them in depth and describe options for correcting them. Instead, he's concerned that the Environmental Planner - acting per earlier conversations with the Board - "presupposes allowing wind generators and the adoption of regulations". I believe they should also address the fundamental issue of whether there is enough wind in the Town to warrant permitting these towers. My unscientific investigation of the matter leads me to believe that you need sustained winds of approximately 15 mph to warrant investing in wind generation of electricity. The wind maps I looked at show that the only places such winds occur are on a few ridgelines, which would mean towers extending significantly above the ambient tree height. This will require a fundamental policy decision by the Town Board, since the aesthetics will impact more than the owner and the immediate neighbors. A map of the county showing wind potential lights up much of Dryden as having potential. I'm not sure how far Perkins' unscientific study extended, or why he thought it was his job as Town Attorney to pursue such study. I suggest that the Town Board first determine whether there is widespread interest in the community to warrant allowing the installation of expensive wind generators or whether the requests are from only a few residents. It seems the Planning Board and/or the Conservation Board may be in a better position to gauge the public sentiment surrounding this matter before the Town Board drafts an ordinance without any prior study of the matter. It is not good government to react too quickly to every new fad, or to change the status quo for a few at the expense of many without good, sound and compelling reasons. If generating power, with state subsidies provided, is a fad, we've come a long way since the hula hoop. I'm also not sure why it's the Town Attorney's task to advise the Town Board on how quickly to respond to requests from residents. That seems pretty clearly to be a task for those who are elected by residents, not the legal advisor. Perkins then proposes keeping the ordinance out of public view - sorry, too late - and adopting a temporary moratorium. Once again, is this really supposed to be the Town Attorney's sphere of influence? Perhaps I need to start requesting and publishing Perkins' memoranda to the Board on a more regular basis. If many of them have this little legal content and this much politics to them - and I hope they don't - it's time to question whether Perkins should be paid tax dollars to draft messages like these. The main reason I had trees cut down last week was to increase the amount of sunlight my yard received to make it easier to grow things. 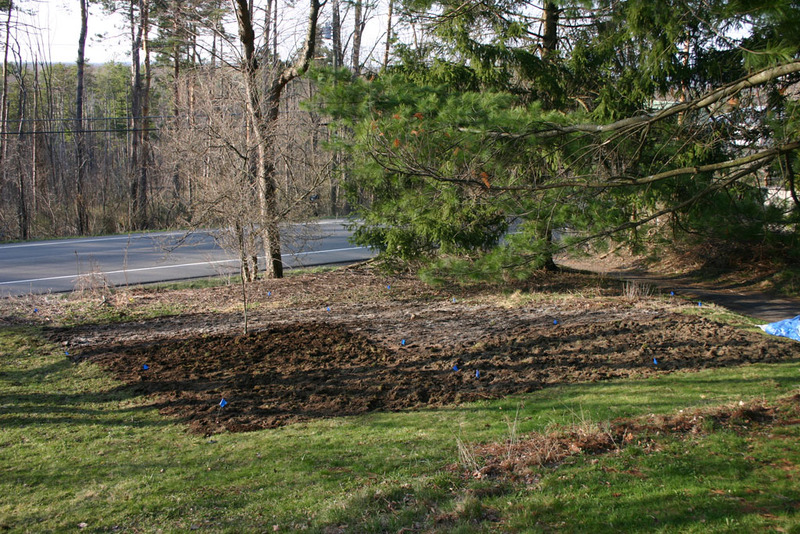 This past weekend and Tuesday evening my girlfriend Angelika and I put ten apple trees, plus gooseberries, black currants, and clover groundcover, into about 850 square feet of what had been my front yard. She took a soil sample from the orchard area to Cooperative Extension for testing, and the results (121KB PDF) weren't exactly ideal. 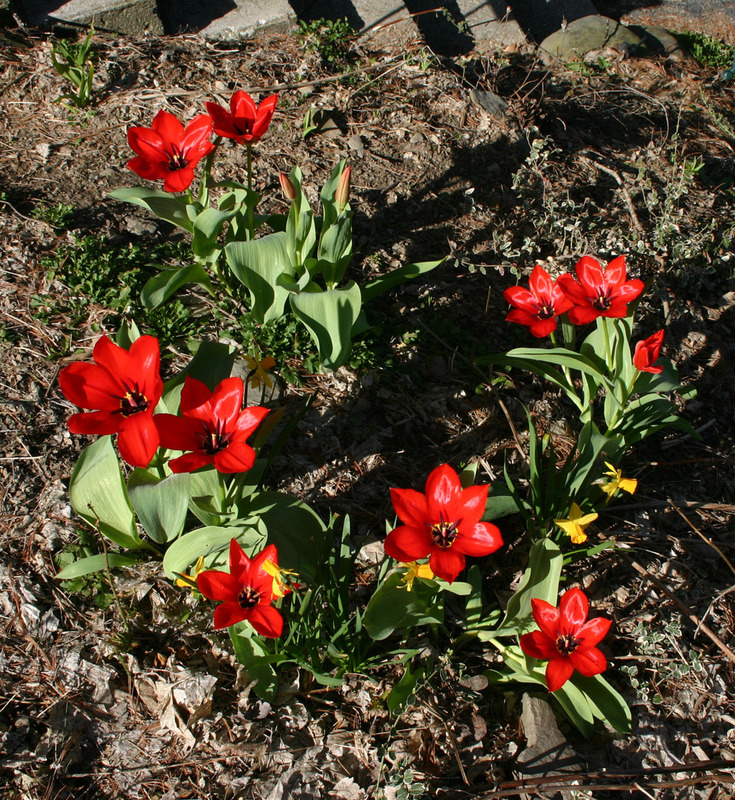 My soil is extremely acidic, low in phosphorus and potassium, and rich only in nitrogen. Cooperative Extension proposed adding lime, phosphate, and potash, which we did this weekend, along with 10 cubic yards of compost. Spreading that wasn't so bad, but then we needed to turn it into the soil, breaking the old grass and mixing the new material with the old. The orchard space, half turned. Fortunately, the top few inches of the soil weren't that rocky, but it took me a while to learn that I didn't need to dig that deeply for this, and I was pretty wiped out. Angelika, who does plenty of this for work, did a lot better than I did. The gooseberries and currants came from St. Lawrence Nurseries up in Potsdam on Tuesday. I especially like that they focus on plants for northern climates. 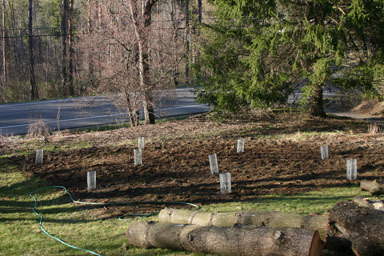 We turned the last of the plot, and focused on planting and watering in the trees and shrubs. Then I made hardware fabric cages for the trees, and spread clover for ground cover. The orchard space, completed, for now. It looks pretty strange now, but there should be fruit there in a few years. The trees are very small now, and will be dwarfs even when fully grown, but there should be lots of fruit in 3-5 years, with the trees hopefully lasting 20. I'm also looking forward to the gooseberries and currants. A quince tree just arrived today and we'll be adding that to the mix here too. We'll be integrating all of this more deeply with the permaculture plans for the house over time, and I need to think about deer fencing. This morning's Ithaca Journal visits Margie and George Malepe, who continue to enjoy cruises despite a fire on board a cruise they were taking last month. They're planning to take their seventh cruise sometime in the future. The Monitor reports that a West Dryden man was arrested for DWI on April 8th at the intersection of Routes 13 and 366. The end result - as it stands now the median household in Tompkins County cannot afford a median-priced home, and less than one-quarter of single wage earners can afford a median-rent apartment. Most of the people who work, live and create the community we call home can no longer afford to live here. In short, Tompkins County is gentrifying — becoming polarized between a small working class in low-end housing and a growing upper-middle and upper caste living in high-end homes. Tompkins County clearly has some choices to make. Will we be the home of Upstate's gentry? Will we swell with a decade of historic growth? Is there some sensible middle ground between the two? Can any approach be planned and coordinated carefully among all 17 local governments to reduce sprawl as well as minimize and equally distribute pressure on existing infrastructure and tax bases? We have a lot to talk about, and no time to waste. So what is this permaculture stuff, anyway? I've written a bit about permaculture lately, and haven't explained very much about it except to point to the wikipedia entry for permaculture. It's helpful, but it's maybe a little abstract, so I'll explain a bit more here about how I see permaculture - permanent agriculture or permanent culture - fitting with my yard, with this website, and perhaps with more people and places in Dryden. You can apply these principles to the world as a whole - which would require major change right now - or you can apply them to smaller scale work, as small as, say, a garden. That still requires change, but on a scale that a person or two can do relatively easily. I'm just beginning this journey. 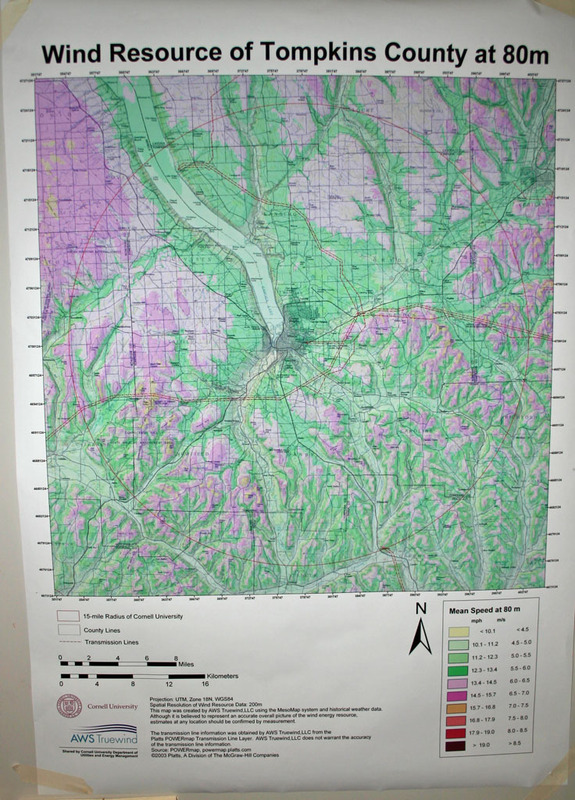 My article on soil survey maps was one start on observing, as was the map-making. I haven't been observing all that long, though, and my interactions with this land have, up until now, been pretty basic. Mow the lawn, do some weeding, fill the birdfeeders, trim things that fall over. I have a lot more observing to do. While I've been doing other things, though, this land has been catching and storing energy - lots of it - in its trees, shrubs, soils, lawn, and more. That's why I kept everything when I had trees cut down: those trees have collected a lot of energy, and there's no reason to send that away as trash when I can have it as logs and mulch. (Especially when forests are suffering because people want fancy mulch!) 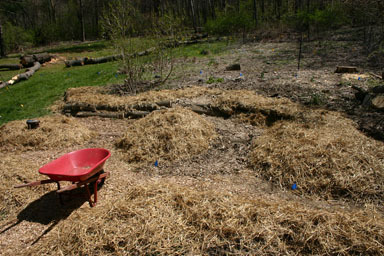 You can even use paper and cardboard as part of a mulch. I'll be working on a lot more ways to catch and store energy around here. The rest of it's in the planning stage. I'm hoping to plant things that support each other, reducing the need for extra inputs of fertilizer and other materials over time. Some inputs at the beginning will be necessary, as my soil is mediocre, but once I have the system of plants going, I hope to reduce those inputs continuously, and generate as little waste as possible. This won't be something that happens quickly: even with the extra inputs (lime, bone meal, potash, compost) we added to the apple orchard, it'll be a long time before that's a stable and productive system. It does include a wider range of plants than grass and trees today, but there will be more to come over time, as I work to attract useful birds and insects to support the plants and protect them from problems. I don't claim by any means to be a permaculture expert, and I've hired Joshua Dolan precisely because he understands this design approach much better than I do. (Reading Gaia's Garden is really helpful, and more practical than most of what I've found, but leaves me a long way from a complete plan.) I hope, however, that as I get further into this, documenting what I'm doing and reporting on the results here will lead other people to see that this is possible, and generate more interest in this form of gardening. One other thing I should mention, to perhaps intrigue some traditional gardeners out there. If this works, though it will take time to establish, it should reduce the cost of gardening and make it easier as well. Small ecosystems complete with predators to eat troubling insects can help avoid the need for poisonous insecticides, and mixed plants reinforcing each other should reduce the need for weeding, as weeds won't have the bare soil and weak competition that fosters their spread. Permaculture principles and practice make sense as a way to enjoy the benefits of gardening while stepping off the treadmill of regular spraying and fertilizing. I hope this will be good on a lot of levels: for the quality of the food I eat, for the state of my wallet, and the state of the world. We'll see how it works on all of those levels over time. This morning's Ithaca Journal visits the My Brother's Keeper Quilt Group, which is based at the Dryden United Methodist Church. They've now quilted over 2000 sleeping bags since 1992. The bags are distributed to people without homes in Syracuse, Cortland, and Ithaca. The Dryden United Methodist Church also gets a laurel from Doris Speer for its recent work testing people for possible bone marrow donations. Dryden residents Jeanette Knapp and Liam Murphy also give out laurels, with Knapp thanking those who helped the Women Making History celebration, and Murphy thanking his Cub Scout troop for lots of hard work. In the print edition but not online, there's a letter from Arthur Barry of Dryden telling illegal aliens he "covered for you" while they were "out protesting against legitimate Americans" and "threatening to make America an Hispanic nation." There are also some photos of a hawk that were taken near the vet school, just west of the Dryden line. Dryden Town Board member Mary Ann Sumner reports on kids working through today's rain to build a willow hut, which will grow into a shelter at 4-H Acres. Sumner also writes about event organizer Jessica Houle, who received the Cornell Public Service Robinson-Appel Humanitarian Award last week. The prize money from that will go into more programs building on the work Houle has done, now with other Cornell students, at Conger's Mobile Home Park. The Dryden Courier noted that work last summer, and it's great to hear that it continues. The print edition of this morning's Ithaca Journal has a full-page ad sponsored by Dryden Mutual Insurance, which recognizes "Heroes" whose donations are at work for the American Red Cross of Tompkins County. In Dryden, the William George Agency, Amazing Grace Bed & Breakfast, and George Bailey Agency are singled out, and there's an ad for the upcoming Ride Out and Music Festival at Amazing Grace this May 5th, 6th, and 7th. On the opinion page, Sarah Padula of Dryden writes to suggest that State Street be renamed Michael A. Padula Street after a slain Ithaca police officer, or Veteran's Street, or not renamed at all. Also on the opinion page, Jay Gallagher has some tough questions for legislators on vacation over the officially passed but not quite done and far from clear budget. 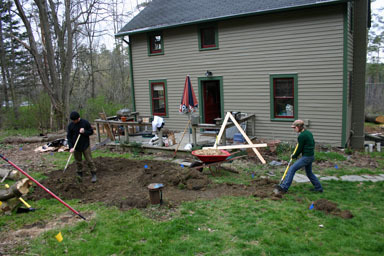 Joshua Dolan and his partner Grace came by my house today to work on contour mapping and also some construction. I'll cover the contour mapping more when there is a complete map, but the work we did to the small yard area immediately behind my house is worth some close examination too. Grace and Josh digging paths. The new pathways and beds replace a small area of yard directly behind my house, and follow one of the contour lines plotted earlier. Soil from the pathway was shifted to the downhill sides to create a barrier to water coming down the hill that will force it into the soil. Then we filled the paths with mulch from the earlier tree-cutting, and that will also break down into soil eventually. On the upper area, there's now a mound of soil which will become an herb garden. The resulting paths and beds. It should develop into an interesting complex system, where each part handles multiple tasks. The raised areas block water and are growing areas, while the paths offer depressions for water to collect and be absorbed by the raised areas while the mulch breaks down and turns into new soil. If it doesn't quite work out, it should be fairly easy to fix - none of this is more permanent than piles of dirt and mulch. It should be a good way to experiment! I mentioned an ad about Red Cross Heroes in yesterday's paper, and today's Journal includes an article on Red Cross Heroes that provides a lot more detail. It leads with a photo of Dryden resident Alicia Dale Alexander, who owns Amazing Grace Bed & Breakfast. They'll be having a Ride Out and Music Festival as a fundraiser on May 5th, 6th, and 7th. Dryden Mutual Insurance is also mentioned as "the top donor to the campaign". Cathy Wakeman's Dryden Town Talk talks about events this coming Saturday. The Dryden Music Boosters will be having their biggest fundraiser of the year, Jazz Night, at 7:00pm Saturday in the Dryden High gym. It combines student music with food and door prizes for $7.00. The middle and high school Jazz Ensembles will perform, as will Dryden Voices and beyondmeasure. She also notes a demonstration of a portable skate park, to be held from 10:00am to 1:00pm on Saturday at Montgomery Park in the Village of Dryden, sponsored by the Town. In the print edition, the Monitor notes the arrest of a Dryden man for charges stemming from a domestic incident, and the arrest of a Locke man for DWI on Route 13 at George Road. Without full transparency in the system - meaning public access to all records involving spending requests and program goals, an accounting of activity for every legislative office, and the details of any decision-making process - there's no way for the public to know if its $200 million sliver is being spent wisely. Short of tracking every press release and ribbon cutting, that is. Pataki vetoed the $200 million fund from the 2006-07 state budget approved by the Legislature on March 31. Lawmakers, who just returned to Albany after the Easter/Passover break, are now deciding which of Pataki's $3 billion worth of vetoes they feel safe enough politically to override in this first election year since calls for reform tossed a few incumbents out in 2004. Political safety is, of course, defined by you. "This is the public's money," said the Senate minority leader, David A. Paterson, a candidate for lieutenant governor. "The public has a right to know where it's going." The Senate minority only has power at veto-override time, but that time is here, and hopefully they'll use it. Celebrating the opening of the Freeville Village History Room! Visit with friends about times past. Check out the display case, and suggest ideas for exhibits! Sounds like a good way to spend a Saturday afternoon. This morning's Ithaca Journal reports that there are three candidates for the three open seats on Dryden's School Board, all of them incumbents: Jeff Bradley, Brian June, and Brad Rauch. There are six people running for three seats on the Ithaca board, only one of them an incumbent. Briefly in Tompkins notes that Ed Hill Road will be closed next Monday and Tuesday. I was sorry to see this morning's Ithaca Journal report that WHCU Morning Newswatch host Casey Stevens will be leaving the station. I had the pleasure of being on the show once, and have listened many more times. Stevens is finishing a program in substance-abuse counseling at Tompkins Cortland Community College and I hope he enjoys his new career. College News includes a list of TC3 students selected for the 2006 Who's Who Among Students In American Junior Colleges . 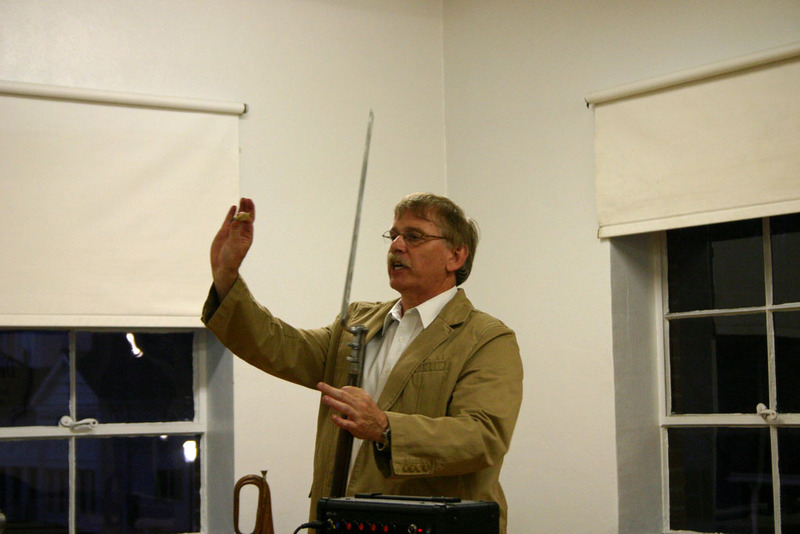 Civil War researcher and re-enactor filled Village Hall with an enthusiastic crowd of listeners on Tuesday night, many of whom had brought in their own artifacts to share. 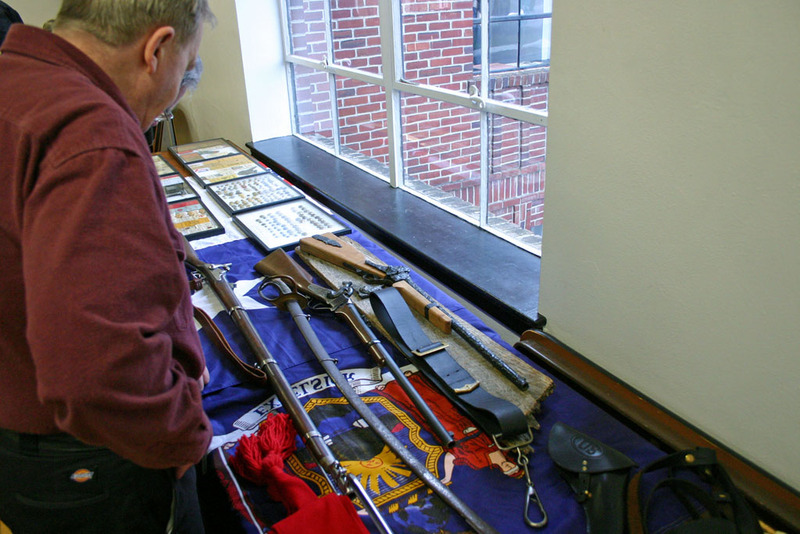 A visitor examines guns from Canfield's collection. Grand Army of the Republic (GAR) discharge papers for Thomas Burch, brought in by a descendant. Canfield described the size and structure of the Civil War armies, noting, for instance, that companies were composed of men who knew each other from home, a key reason they held together under heavy fire. He talked about the impact these enormous armies had on the territories they visited, even outside of battles, and how ever-increasing prices for supplies helped Dryden in that period while devastating the areas in which the armies foraged. One aspect I especially liked was Canfield's comparison of Dryden with a town of similar size, Winchester, Virginia, which changed hands repeatedly - anywhere from 14 times to 100 times, depending on how you count. Dryden was lucky to be safely out of the battle areas, waiting for its noon coaches from Cortland and Ithaca to bring it news of events. After the main presentation, he talked about the many items he had brought and took questions from the audience. Tom Canfield demonstrates loading a Civil War rifle. One of the items he had was a ledger from Cortlandville, whose owner wrote in 1866 of some furniture he had bought from the Lincoln family after the president's assassination. There may yet be some very valuable chairs in the area! If you'd like to see more, I've posted a gallery. I wrote earlier about the beds and paths we built outside my back door on Monday, and on Thursday and Friday we continued that project. Behind my house there is a deck, was a yard, and is then a series of garden beds. The one closest to the house sloped fairly sharply, so we set out to extend it and give it a firmer downhill wall using the logs left over from earlier cutting. Because a box elder had been chopped down near this garden, we used the box elder logs, digging trenches for them and fitting them together. 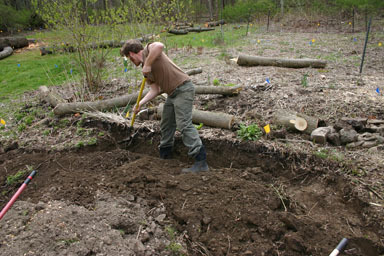 Josh digging a trench for terrace supports. 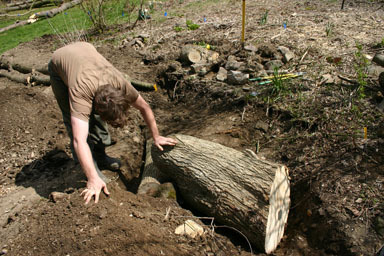 Fitting a trench to a tree. Most of the time we were able to fit logs without too much cutting, though we did break out the chainsaw at one point to split a log that almost fit. We also managed to use a gigantic piece, digging it a trench that let it fit into the wall where otherwise we would have used two logs stacked. Using a huge log for two levels. 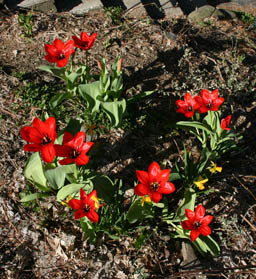 We preserved most of the flowers in the bed, digging them out and putting them back when necessary, and extending the bed toward the house made that much easier. Then we seeded all of the beds with Dutch White Clover mixed with inoculant, and covered everything over with straw and mulch. The straw has the unfortunate effect of blending everything together, but when there's more green there I'll be posting more pictures that will hopefully give a clearer impression of what we did. I've also posted a gallery of pictures of the project.